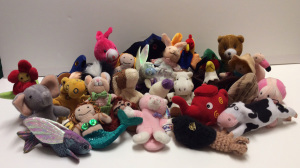 The Starry Telling Adventure shows many ways Starry Telling can be used, and you can create many more. If you are going to be indoors, there is an electric campfire with a silk flame you can order online. Ask people to sit in a circle around it. I made a talking stick that can be passed around, and only the one holding the stick could talk. Someone else made an answering feather. We had three children in the group, and they would transfer the stick to the one who wanted to talk next. Blankets or Shawls often add to the experience. Hand puppets or finger puppets help people to be more spontaneous. Whatever focus you choose, be sure that the goal is to create upward collective emotions which become more palpable as each one shares. The purpose is to imagine and create situations and circumstances that are uplifting now and in the future. 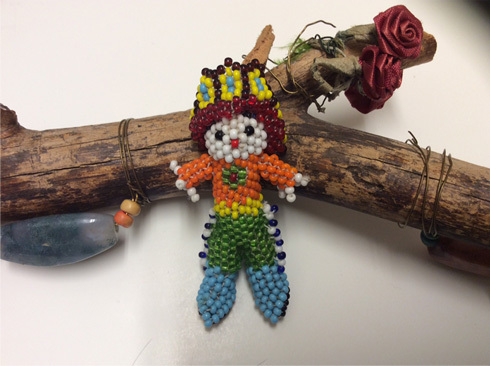 It can be fun to create your own talking sticks and puppets. This is also a great inter-generational activity. 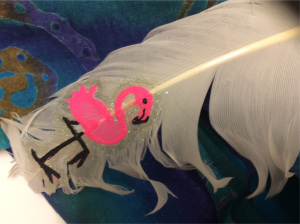 Details of the “Chief” and the Pink Flamingo on the feather. To return to the “How To Page with links”., click to return.